Date: Wednesday, 1st March 1989. 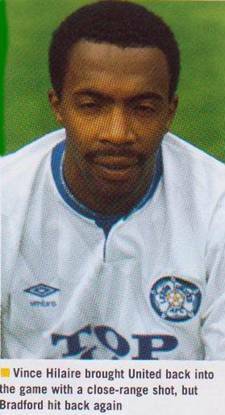 Scorers: Leeds United: Blake, Hilaire Baird. 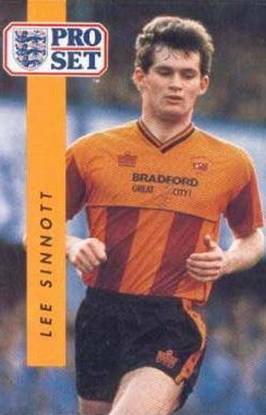 Bradford City: Day (og), Costello, Sinnott. Attendance: 33,325. (Receipts: £ 103,000). 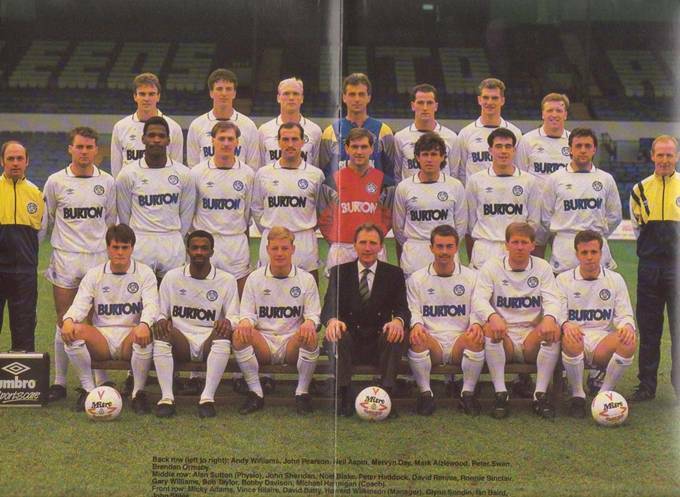 Leeds United: Day; Aspin, G. Snodin; Adams (Aizlewood), Blake, Rennie; Batty, Sheridan, Baird, Davison, Hilaire. 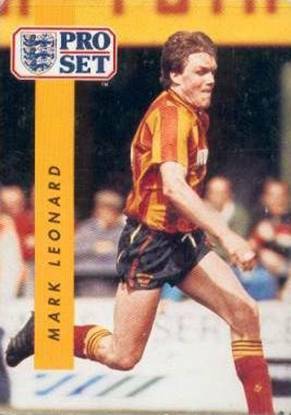 Bradford City: Tomlinson; Mitchell, Oliver; Banks, Jackson, Palin (Goddard); Costello (Thomas), Sinnott, Leonard, Kennedy, Jewell. Referee: Mr P.S. Danson, Blaby, Leicestershire). 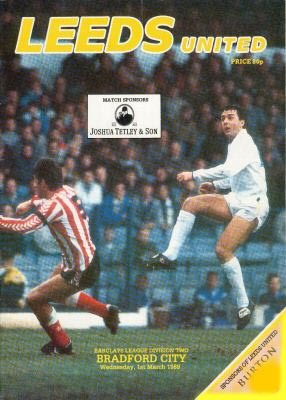 Elland Road has staged some outstanding matches over the years, ones that keep you on the edge of your seat and jangle the nerves at almost every turn. 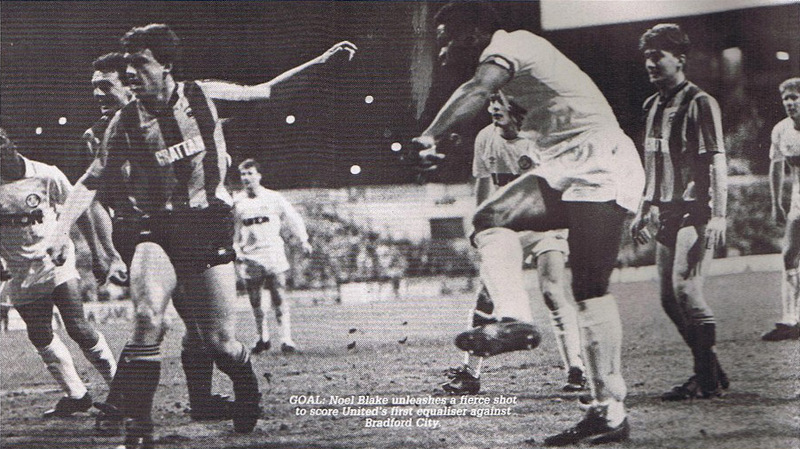 One match that fell into that category was against Bradford City in March 1989 and both teams played their part in a thrill-a-minute local derby. United’s biggest crowd of the season, 33,325, were treated to a six-goal feast and plenty of near misses in a frenetic ninety minutes spectacular which resulted in the players of both sides being given a standing ovation after the referee had blown the final whistle. 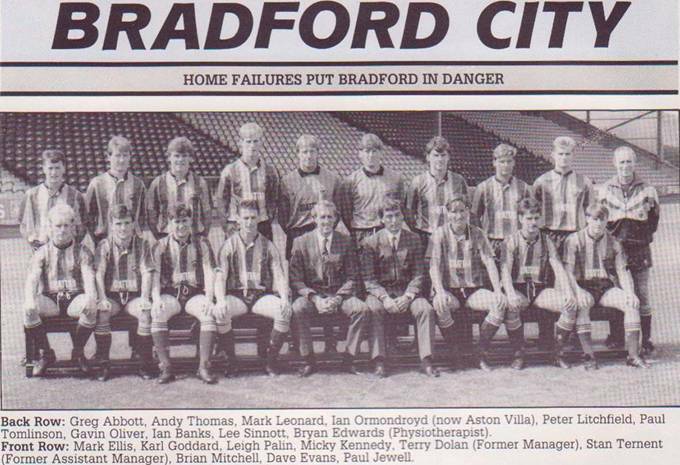 The day before the game, however, the men from Valley Parade had come close to asking the Football League to postpone the fixture because of illness and injury in their camp. Six City players attended a sick parade call on the morning of the game after suffering from flu symptoms the day before and two more were on the injured list. Goalkeeper Paul Tomlinson, midfielder Ian Banks, defender Peter Jackson and forwards Mark Leonard and Peter Costello were the players that had been unwell. Greg Abbott was suspended. Dave Evans was out through injury and there was a fitness doubt about Lee Sinnott. “We were on the verge of asking for a postponement and though things were not too good we eventually decided we would play on,” City manager Terry Yorath said. As things turned out all the unwell or the players doubtful through injury were able to play. Howard Wilkinson was in his first season as manager of United, having taken over from Billy Bremner some five months earlier, and he was in the midst of re-organising team affairs. Ironically he had concentrated initially on tightening up the defence and in the ten games leading up to the one against City his side had kept seven clean sheets. If City had any respect for United’s defensive capabilities it wasn’t apparent as three times they took the lead but in the end had to settle for a 3-3 draw. “The match began at boiling point and simmered throughout without ever getting really nasty.” The United manager said. The purists would probably have picked out defensive faults and the apparent inability or unwillingness of any player in either side to steady the pace but few fans would have gone home feeling they had not been entertained by a cracking contest fought in the best traditions of British football. Former United star Yorath, bringing a team to Elland Road for the first time as a manager, clearly had his men fired up and such was the directness and ferocity of their work that there was little United could do early on but back-pedal. Three times United’s defences were breached by a City side showing speed and an unrelenting desire to attack. Each time, though, United had the ability and determination to bounce back. 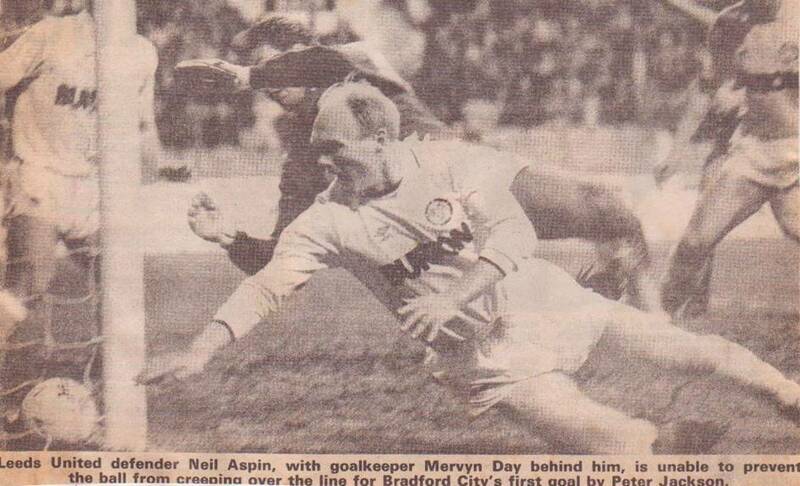 The game was only five minutes old when City took the lead, Peter Jackson heading against the bar only to see the ball bounce back and go in off United keeper Mervyn Day. 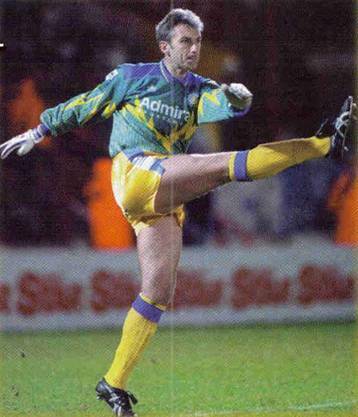 United were level after fifteen minutes when Noel Blake fired in off the underside of the bar, following a long throw from David Batty, but City went ahead again on the half hour mark as teenage City striker, Peter Costello, raced away following a long clearance and fired a fierce shot past Day. 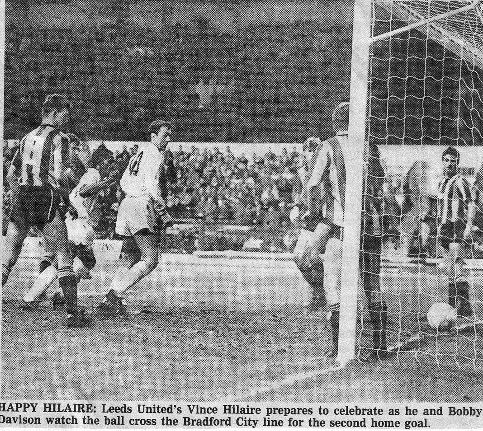 Five minutes before the break United pulled it back to 2-2 when Vince Hilaire turned the ball in from Noel Blake’s low shot from the left. There had been four goals in the first half. Could there be more to follow? Talk at half-time suggested the answer was in the affirmative, and so it proved to be. Lee Sinnott took only four minutes of the second half to put City 3-2 ahead, when he headed in from a corner and United had to wait until eight minutes from the end to haul themselves level again. Ian Baird, who went into the game seeking to end a goal drought that had lasted for seven games, was on hand to knock the ball in after keeper Paul Tomlinson had failed to hold a fierce shot from substitute Mark Aizlewood. “It does not matter who gets the goals just as long as someone in the side is scoring but forwards thrive on goals and I said before the game that I could really do with a goal in this game. I am delighted to have got the goal that in the end brought us a point.” Baird said. His manager was just as pleased. “We showed a lot of determination and courage to come back three times and we deserved our point,” Wilkinson said. Although United really needed a win to boost an outside chance of making the promotion play-offs, they had to regard the draw against their near neighbours as being a point gained rather than two lost. From a club point of view, there was the ‘consolation’ of gate receipts of £103,000 from the Second Division’s biggest crowd of the season. It was almost 300 higher than the Division’s previous best of 33,034 for United’s game against Manchester City at Maine Road two months earlier. YEP: Three times Bradford City were in the lead, three times Leeds United powered back in this evening clash in one of the most memorable derby games seen at Elland Road. The Second Division’s top crowd of the season of 33,325 was spellbound by the often frenzied but always open, hit-and-run game. 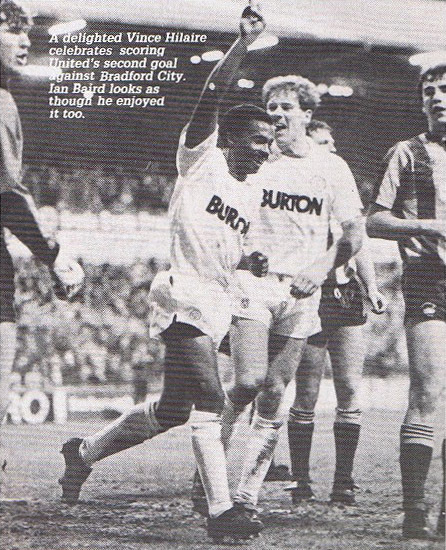 Until Ian Baird grabbed his first goal of the year eight minutes from time, it seemed that the Leeds old boy Terry Yorath would lead City to their first League win at the ground for over fifty years on his first return to Elland Road as a Manager. Yorath said, “We came for three points but in the end I was happy the way things turned out. We have the basis for next year.” Leeds Manager, Howard Wilkinson, thought his side showed a lot of determination and courage in coming back three times. “If we can do that kind of thing between now and the end of the season, we will be there or thereabouts,” he said. Little wonder that the two sides went off to a standing ovation. There should have been a special hand too for the referee, who though having to watch the match like the arbiter in the Tyson-Bruno contest nevertheless let it flow freely. It all started with a fire and brimstone opening that went on burning. City grabbed the lead in the fifth minute through Peter Jackson in much the same way that Leeds had snatched an early lead in the 1-1 encounter at Valley Parade in the previous October. The two Captains Mick Kennedy and Noel Blake, team-mates a few seasons back at Portsmouth, both played important roles as the pattern was set. By half-time a non-stop clash had provided four goals and four bookings. Mick Kennedy opened the way for the breakthrough goal with a huge throw-in from the left. 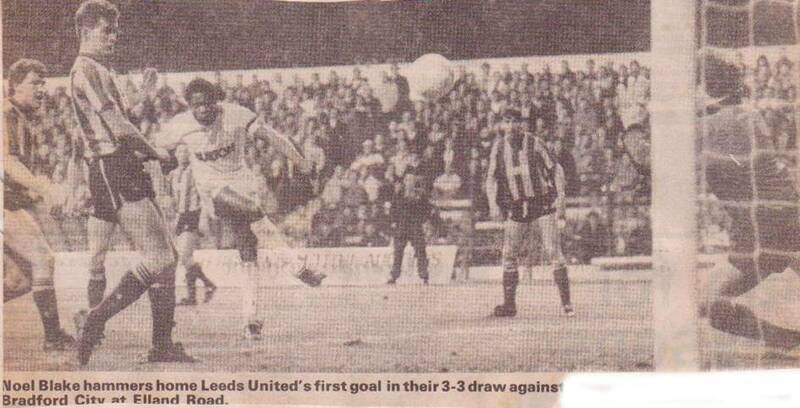 Jackson met it at the near post and the ball hit the woodwork and Leeds goalkeeper Mervyn Day as it crept in. 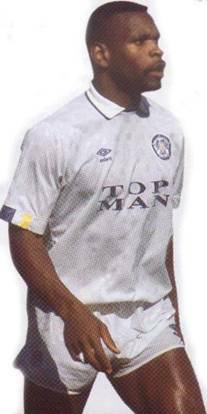 Noel Blake came up with the equaliser ten minutes later when David Batty’s long throw, again from the left, was not cleared and the centre half hit a ten-yard shot into the roof of the net. 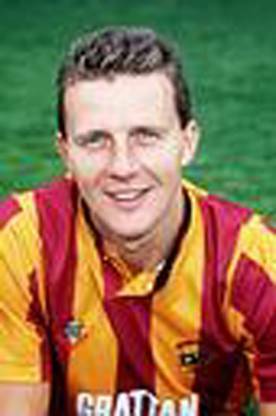 Ian Baird was booked quickly followed by Mick Kennedy, Peter Jackson and Paul Jewell as the referee kept a firm hand. City moved into the lead a second time in the thirty-third minute. It was a goal with their brand stamped upon it. 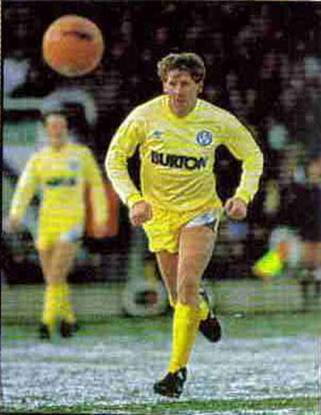 Paul Tomlinson claimed a Leeds corner and, with a prodigious punt downfield, found Micky Adams wanting as City’s young striker Peter Costello raced through the middle. The nineteen-year-old took the ball in his stride and whacked in a fierce eighteen yard drive for his second goal of his career. 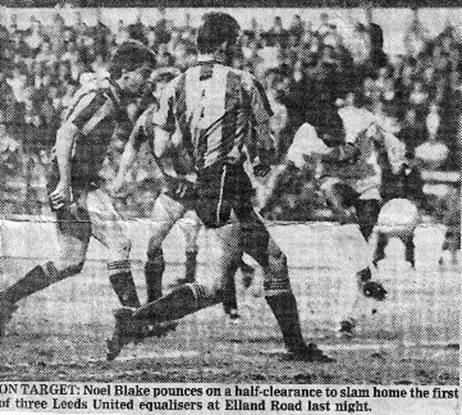 Noel Blake, twice, and Ian Baird went within a whisker of scoring for Leeds, whose second equaliser came two minutes from the break with Noel Blake again a central figure. He fastened onto Glynn Snodin’s corner at the far post to hit a shot across the goal, which Vince Hilaire turned in from close quarters. City, with hamstring victim Dave Evans absent, abandoned their sweeper system, to contribute to an open contest. Ironically, in a hard fought game they led for the third time with one of the softest finishes of the night. Lee Sinnott’s header from Leigh Palin’s corner looped into the net in the fiftieth minute with Mervyn Day completely deceived and moments later he could do nothing about Peter Costello’s fierce angled drive which smashed against the woodwork. 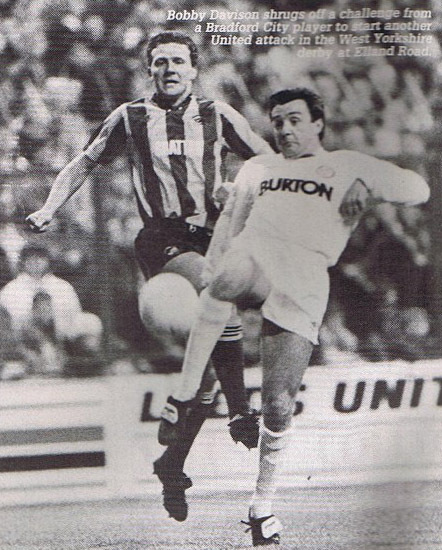 At the other end Paul Tomlinson made two marvellous stops to deny Mark Aizlewood and Ian Baird in the space of a minute and then did even better when he blocked Aizlewood’s close-in header. 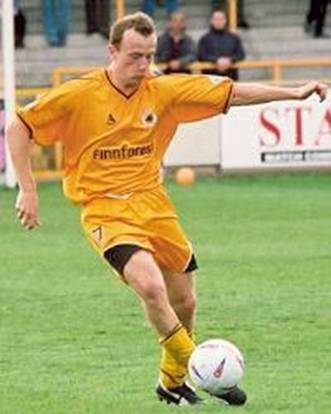 But he had little cover with City down to ten men as Leigh Palin received treatment on the touchline, and Ian Baird was able to force the ball in from ten yards. Leeds went hunting for the winner but Tomlinson, unsighted, barred the way when Neil Aspin’s eighteen yard drive took a late deflection in the last minute. Fittingly the teams shared the spoils.